You don’t gain wrinkles in your skin – you lose collagen. DOT Therapy Fractional laser treatments work with your natural facial structure by targeting the layers in the skin that produce collagen. DOT therapy uses hundreds of tiny pillars of laser energy to penetrate the skin and stimulate the body’s natural collagen production. The laser ablates a small percentage of the skin while leaving healthy tissue in between. 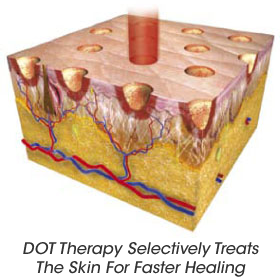 DOT Therapy delivers enough heat to stimulate the production of new collagen while leaving the skin able to heal in a few days.